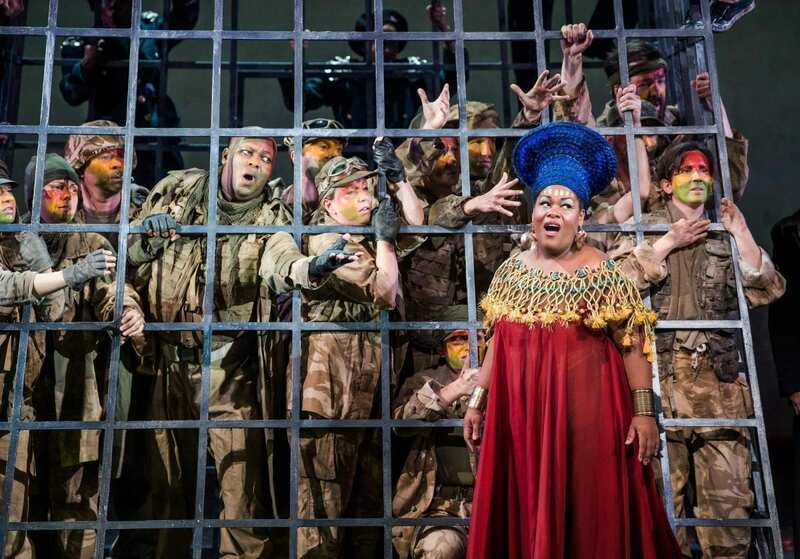 Aida is grand opera in every way – big voices, huge choruses, and lots of extras. And this ENO production, directed by Phelim McDermott, certainly goes for scale and impact. To be honest it is not Verdi’s most inspired music – it is perhaps cynical to say that it was the money the Khedive of Egypt paid him to write it, rather than artistic inspiration, that gave rise to Aida but it certainly lacks some of the magic that we find in earlier scores. But with visual flair from the production team and top quality performances it can be a great night at the opera. This version does not quite make that grade. Egypt is under threat from the Ethiopians. Radames is chosen to lead the Egyptian army against the invaders. He is loved by the king’s daughter, Amneris, but he loves Aida, the Ethiopian slave who serves Amneris. Radames triumphs in battle and returns with a group of prisoners which includes Aida’s father, Amonasro, the King of Ethiopia. He persuades his daughter to exploit Radames’ love by finding out the Egyptian battle plans for the attack on his country. When Radames realises that he has been betrayed he surrenders to the Pharoah, refuses to defend himself, and is condemned to a dreadful death. The two central roles are wonderfully sung. Latonia Moore is a very fine Aida. Her top notes were warm and striking and her vocal stamina was more than adequate for a long and testing evening. 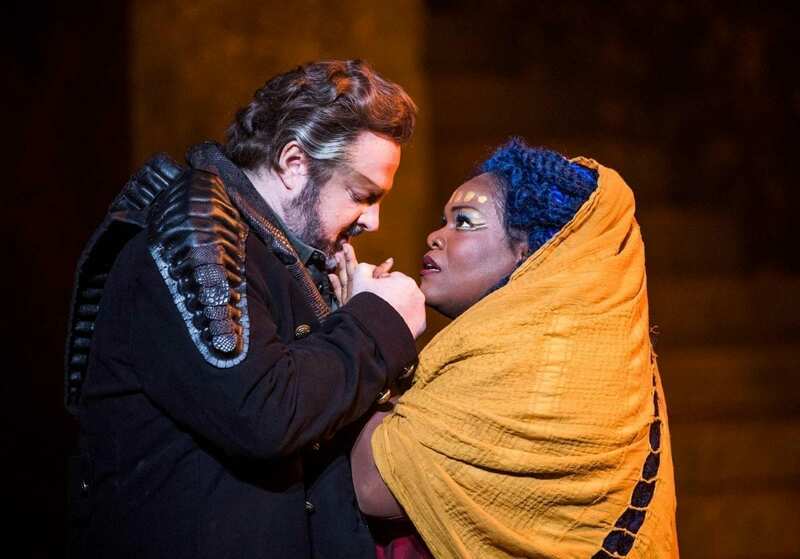 Welsh tenor Gwyn Hughes Jones is an equally convincing Radames, as much at home singing the triumphal music of the Egyptian army as the yearning love duets with Aida. 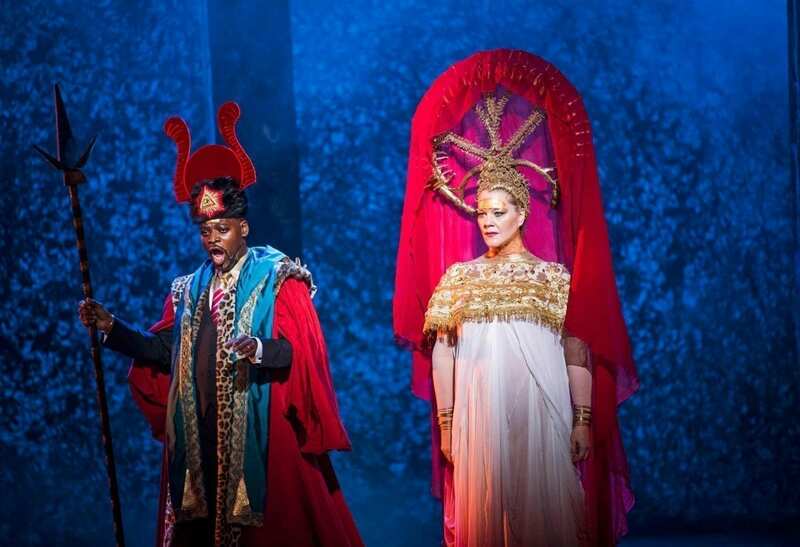 South African baritone Musa Ngqungwana is an excellent Amonasro; his duet with Aida as he coerced her into betraying Radames was full of real dramatic tension. Michelle DeYoung did not sound at home with taxing role of Amneris and by the last act the voice sounded forced but she was not helped by a director who too often left her immobile, and isolated from the other singers with whom she should have been in dramatic contact. Her costumes were bizarre and unflattering too and that brings me to the question of the visual design of the production. I loved McDermott’s production of Akhnaten which showed visual and dramatic flair that served the story. The strange and unconnected looks of different participants in this production left me confused and unconvinced. Radames begins by looking like a general from Ruritania. The priests at first look like Orange Order marchers and later like extras from the haunted oak scene in Merry Wives of Windsor. There is a troop of female acrobats who create striking tableaux that are decorative but never very relevant and the final scene which should be tragic and oppressive had none of those qualities. Conductor Keri-Lynn Wilson handled the enormous forces demanded by Verdi with verve and style and the most thrilling moments in the production were quite properly the big set pieces which the ENO chorus sang superbly, despite the extraordinary costumes that encumbered them. This is a production well worth seeing for the quality of the performances – and for a chance to make up your own mind about the way it looks. This is a tough one to talk about. A new production of Aida should be a major event these days. 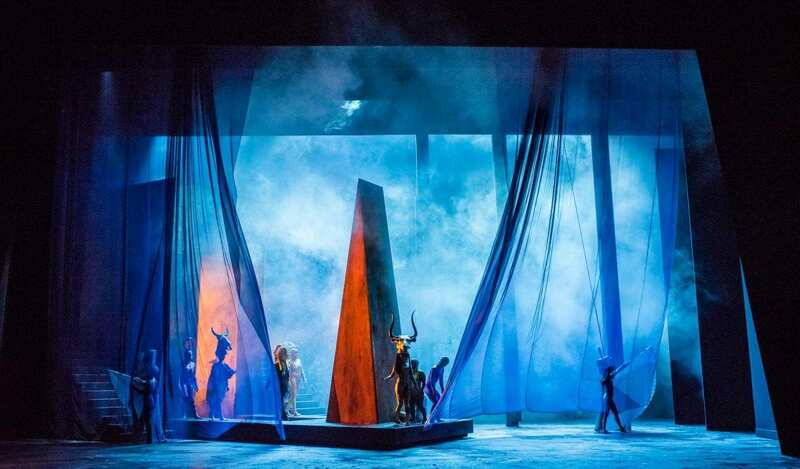 The one that opened last week at the English National Opera caused a lot of excitement in anticipation because of the Olivier Award Winning director and the fact that no one has done a decent Aida in London for ages. Well, as far as I am concerned, they still haven’t; and yet I would not have missed seeing this for various salient reasons. The principal delight to my mind was the conductor, Keri-Lynn Wilson. Clock that name! I felt she had a rich understanding of the score and I loved the way she controlled the orchestra. I was also completely captivated by the Aida of Latonia Moore. She has a stunning voice with remarkable evenness throughout its range. The sheer sound is enough to justify her performance, but she also managed to portray the vulnerability and the sheer loveliness of Aida. 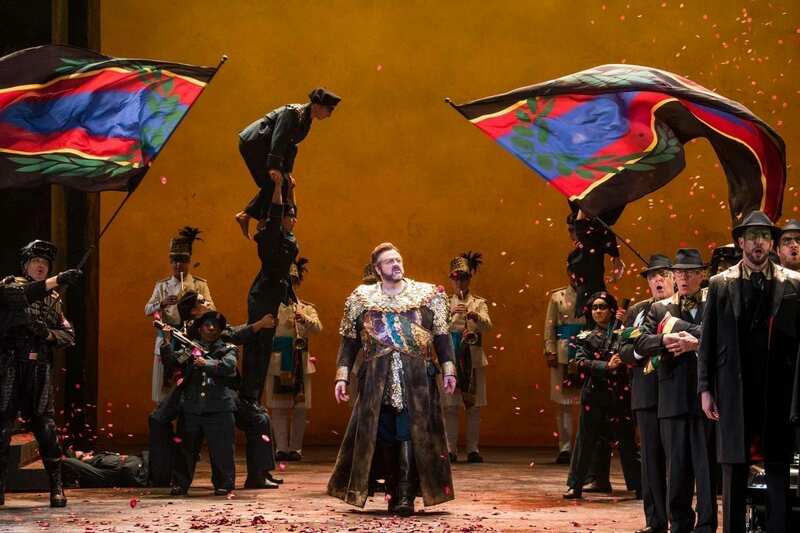 Gwynne Hughes Jones has a totally appropriate voice for Radames – he can be stentorian, martial, brilliant in his tone. He also acted the role convincingly and followed the dynamic markings of the score, including the notoriously difficult diminuendo at the end of his aria “Celeste, Aida”. The entire cast was a strong one. Everyone deserved praise for their singing and their commitment to the dramatic characterizations. But the whole production by Phelim McDermott and the incoherent costume designs by Kevin Pollard seemed to me to be one of those where the director imposes his own version and vision of the tale and is not all that much interested in eliciting some sort of interpretation based on what is actually there in the score and the text! Some of the costumes the women were wearing could do service in Stephen Sondheim’s Follies for the ghosts of the chorus girls with those head-dresses. There was no integrated vision of Aida as a work of art. For its musical performance, I would give this production serious praise and find myself also interested in the singers announced the cast changes later in the run. I came away reminded of just what a wonderful, rich opera this is, Verdi at his best dramatically in every way, in full command of his resources, knowledgeable about what to write for the human voice so that it has maximum impact for the telling of the tale and the revelation of the characters. So if you are trying to get to know Verdi’s Aida, maybe you should just go and get, if you have not already got them, or download, the classic recordings of Aida with Leontyne Price, Jon Vickers and Rita Gorr conducted by Solti or the old Maria Callas recording conducted by Tullio Serafin or even the old Von Karajan recording with Renata Tebaldi and compare them to your heart’s content. Also, there was a very fine production of Aida at Salzburg last summer that was broadcast on TV in France. Let us hope that that turns up on DVD one day. 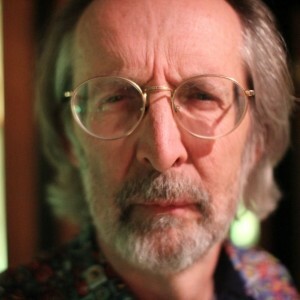 Mel, thanks – really interesting comments. I was thinking of four stars for the music but the confused/confusing production took it down a notch. I really hope we get a chance to see the Salzburg version some time.